Cayuga Community College student George W. Lapage of Scriba received a $250 scholarship from the New York State Sheriffs’ Association. 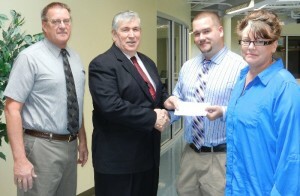 Oswego County Sheriff Reuel Todd presented him with a check on April 24 at the college’s Fulton Campus. 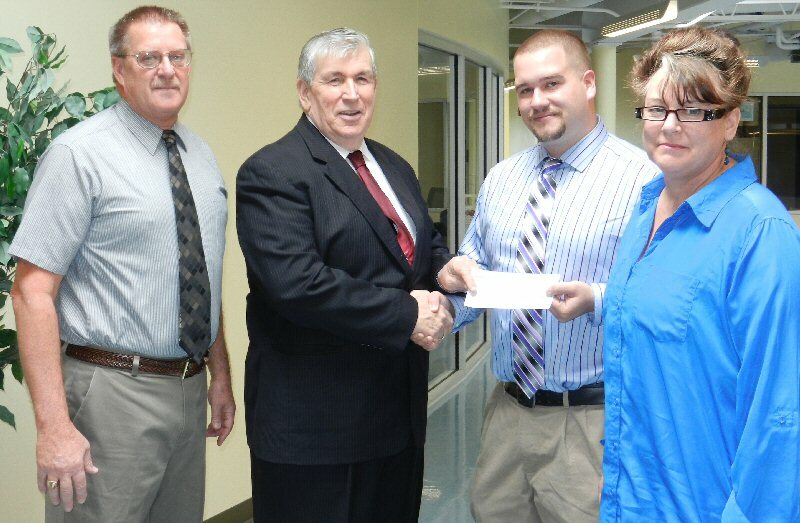 Oswego County Sheriff Reuel Todd (Middle left) presents Cayuga Community College Criminal Justice Student George Lapage of Scriba with a $250 New York State Sheriff’s Association scholarship. Professor John Lamphere (left) and Fulton Campus Associate Vice President and Dean Maggie Killoran (right) are also pictured. A 2005 graduate of Mexico High School, Lapage will graduate in May with an associate’s degree in criminal justice, with a concentration in police work. He hopes to continue his education at a four-year institution, and will use the scholarship toward his educational expenses. Todd said this scholarship helps retain some of the best talent in the state and encourages them to work at a law enforcement agency. Many of the previous recipients of the award currently serve in the Oswego County Sheriff’s Department or county Correctional Facility, he said. “We been fortunate to recruit a great group of young people to stay local and work as deputies,” Todd said. “Historically, just about everyone who receives this award ends up working in law enforcement,” said Professor John Lamphere, a retired Cayuga County Sheriff’s Department lieutenant who received the outstanding criminal justice award as a student in 1974. While Lapage is not yet certain of his future career path, he said he is thankful to have received the scholarship and hopes to further his education in the immediate future. Each year, the New York State Sheriffs’ Association awards 32 scholarships for $250 throughout the state. One scholarship is awarded at each community college in the state. The scholarship recipient is selected based on academic excellence and a proven desire to pursue a career in criminal justice or a related field.